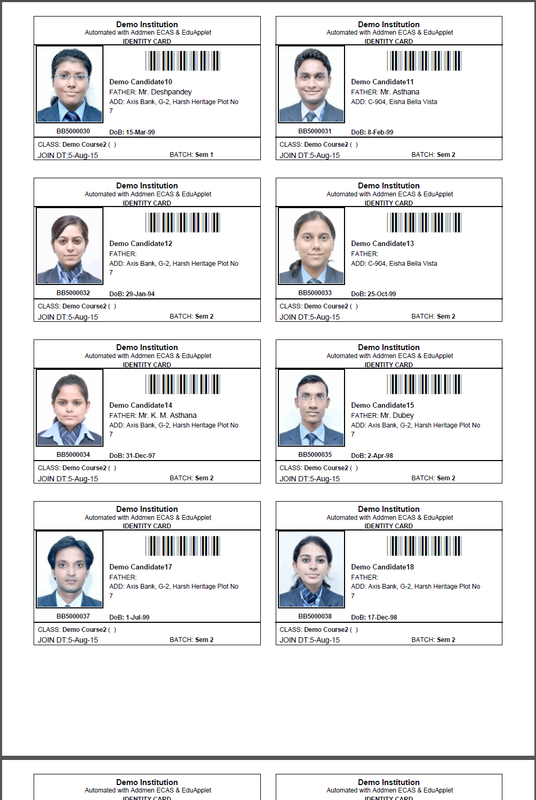 An Institute Management Software for automation of all types of Educational Institutes. Select Modules can be implemented so that software price is minimum. Standalone PC/LAN Version: Offline Modules for working on a closed network. Online (Browser) Version: Modules which run on the Server-Client structure and operate in a closed network or over the internet and can also be connected to the website. A Server-Client structure based Online Automation System running on a Web Browser accessible over the internet meets all these requirements and provides a platform to leap into the future. The system has many advantages over a few limitations as compared to a Standalone/Network based systems. Standalone (PC/LAN) Version is available only for purchase, while Online (Browser) Version has 2 Modes of implementation (Purchase, ISP rental & Full rental). Make unlimited branches & unlimited administrators. Final payment is according to total number of candidates. So it is good for rapidly expanding institutes who have more number of branches but relatively less number of candidates at each branch. Software is integrated with your website. It appears to be a part of your website. Your logo & name is visible on the software. Each administrator gets a login ID on which specific permissions can be allocated. Each student can be given a login ID. Administrator can have complete control over all branches and get detailed reports. Your previous year data is made functional on the software. Data fully secure in a dedicated server at High security data centre. 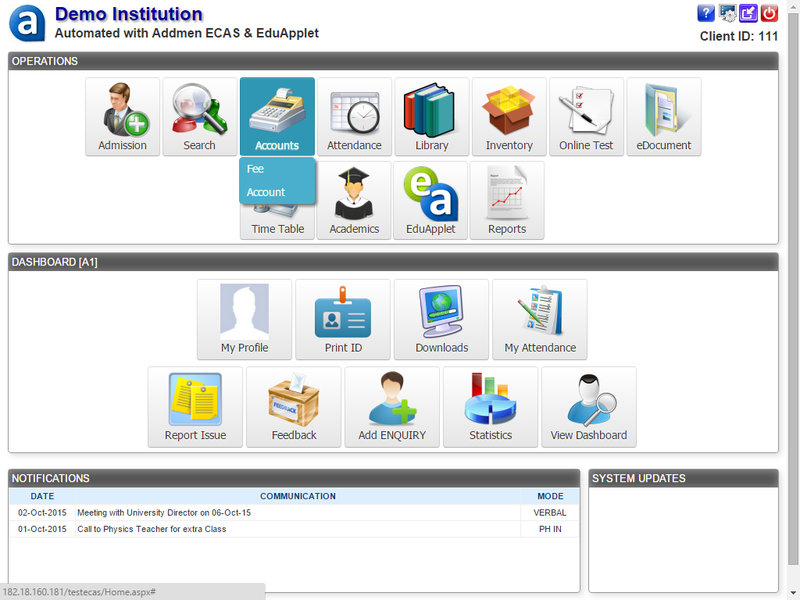 Discreet admin accounts to each institute. Download backup of data whenever required. Since this is a very versatile Software which can cater to various types of Institutes like School, College, University and Coaching Classes, hence it is client-end customisable to suit the needs of a specific institute. The login account you will get can be used for both the below given logins. This will give you a fair idea of the flexibility of the software. OPTION 1 > Rental Plan (Most Recommended): This is the most cost efficient means to make use of all the features of the software at negligible price of Rs. 10/- per candidate/year and try it out before you make any investment. Requirements of Rental Option: User simply needs a normal internet connection. No other requirements. No need for investment into server & other infrastructure. No botheration of maintaining technical infrastructure. Start working on the very first day. Can operate for unlimited branches, unlimited candidates. Students, parents and faculty members can equally participate. User can start working from anywhere using his password, based on his permissions . Freedom from technical tasks of installing, maintaining and backup of software and data. Backup and administration is responsibility of Addmen. Updates & features are reflected immediately as they are developed without bothering you. No unauthorised access to data as data is on secure distant servers. Only owner of the institute has the access to data. Safety of data from forced investigation (As the data is not present at your work location). Previous years data can be accessed from Backup server if required. Limitation of Rental Option: Since the system runs from a distant source like a website, so it cannot operate in absence of internet. OPTION 2 > Client can purchase and install selected modules of the Online version of ECAS and run from their own Server. Good for large group of institutes who have several schools/colleges or several branches because they already have server, administrator and software licenses and hi-speed internet connections. So they do not have to bear any extra cost. There is no problem of internet disconnection. Limitations of Purchase-Install & Run Option : High initial cost because of too many system requirements. Above mentioned infrastructure is the most elementary requirement which works well for limited number of users and/or branches. But if the load on system increases like every student given login and participates for Online Test or Online Result, then the above infrastructure seems limited and better arrangement is required which is obviously costlier. Client can purchase selected modules of the Standalone PC/LAN version of ECAS and install on their own PCs or Laptops. Requirements of Standalone PC/LAN Version: User must have a PC and a wired/wifi LAN if required to run on network. Advantages of Standalone PC/LAN Version: Good for personal operation where the institute administration is single handed. Also suitable for individuals who do not want to keep data on server because of security hitch. Limitation of Standalone PC/LAN Version: This version has a limited operation scope and cannot be linked to website for real time update and access by student and parents. Also the user must know basic computer maintenance and must be able to take backup of the system and installation. Client Customizable : Same installation can support multiple institutes with varied course and fee structures spread over multiple operation/financial years simultaneously. User Friendly : Efficient data input panels with similar trend of operation through out the software. Rugged auto checks at the time of data entry. Flexible Reporting : Very elaborate reports with thousands of filter and presentation combinations. Reports layouts are client end customizable. Data Security : Very secure with multi-tier access. Limited access for each user to specific panels and even to specific functions on a given panel. Each entry in financial/ marks/ master database bears the signature of the operator. Wi-Fi Ready : Access your data or applications from anywhere in the campus. Barcode / Smart Card / Biometric Machines: Compatible with various ACS like Fingerprint Reader, Smart Card etc. (Customised integration). Touch Screen Interface : Software supports Touch Screen Display of summarised candidate accounts, marks and attendance info, posting of leave applications, document and library reservation requests. Enquiry & Followup: Detailed classification of admission enquires on basis of course, city, area, type of admission, publicity source etc. Hostel Management: Room wise occupancy & vacancy status and information of hostlers including their accounts. Transport Management: Reports according to bus/routes/stops and students using this service Maintains schedule for a bus/route and related accounts. Mess Management: Data of students using mess service includes details of their meals and accounts. Study Material/ Kit Management: Material required, issued, returned, damaged, information student accounts related to items issued, delays & fines. Leave Application: Online leave application, sanction and information to various departments. Correspondence Records: Couriers and posts dispatched & received records. Complaints & Suggestions Monitoring: Online complains, queries monitoring and resolution. In-Campus Healthcare: Biostatistics like blood group, height, health and Health record of allergies & reaction In-house medical officer report & recommendation. Customisable: Define your own Accounts and Heads, make your own instalments and fee plans. Detailed Records: Each Collection/ Cancellation or Refund transaction in any head can be retrieved for editing or reporting. Extremely Flexible: Covers both Standard fee structures and customized fee plans for each student. Absolutely Secure: No financial entry is erased; only new adjustment entry can be made. Each entry bears time stamp and digital signature of the operator. Rebates & Fines: Allows incidental Credit/Debit entries as fee Waiver, Auto fine on late fee payment, any other concession or extra charge besides regular fee structure. Report & Printing: Auto printed customised fee receipts. Individual & ##39's account statements with all credits & debits. Numerous report of Collection, Cancellation, Refund, Defaulter, Concession, Cheque Details, Advance, Dead payments for any time period. Attendance: Automated attendance through Barcode or Smart Card. Charts and calculations are drawn automatically. Manual feeding or import of attendance from other device is possible. Online Assignment Manager: Online creation of Subjectwise Topicwise Assignments by teachers Online submission of Assignments by students Online display of grades and comments of teachers.